On June 5, 2012, Venus passed between the earth and the sun. With an appropriate filter to make viewing the sun safe, it was possible to observe this rare phenomenon. Well, we should clarify that you have to be able to see the sun! And on June 5, that meant leaving the greater Seattle area in search of a break in the clouds. Weather reports and satellite images indicated that our best chance was to head south (not over the mountains as we had originally planned). We were looking at Centralia or possibly Olympia. Normally for a trip of this distance, we'd take the Roadster. But, after looking at the pile of astronomy stuff (including a 4" telescope and its tripod) and the Roadster's limited trunk space, we realized we needed to consider other options. 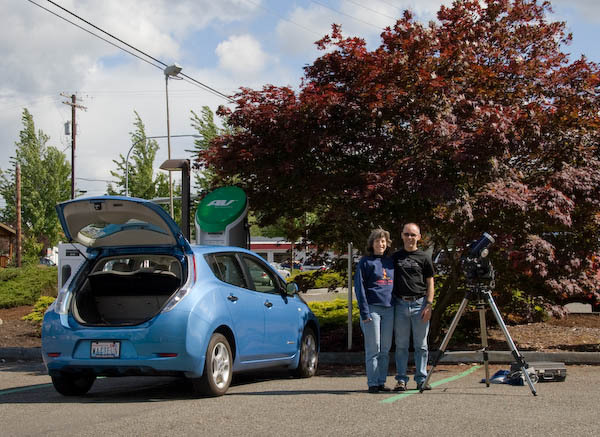 The local LEAF community has recently been abuzz with excitement about newly-installed DC Quick-Charge (DCQC) stations, which charge the car to 80% in under half an hour. Tom's been following this discussion closely and remembered that the Tumwater station had been confirmed operational by other owners. So, we decided to head there for our adventure. We left Bellevue with a full charge under rainy and overcast skies and started our drive south. The rain cleared, and by the time we were in Tacoma, we could see blue sky and an occasional glimpse of the sun. We made it to Tumwater with a comfortable amount of charge still remaining in the pack, but definitely in need of a charge for the trip home. We plugged in and had fun watching and (of course!) logging the quick-charge. station while observing the Venus transit. 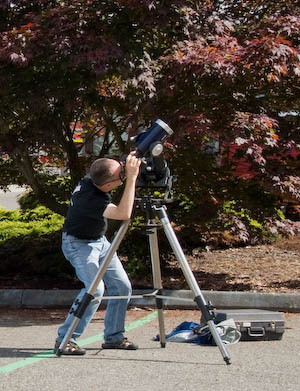 Tom aiming the telescope to capture the Venus transit. The skies in Tumwater were partly cloudy, but the sun was visible most of the time, with occasional clouds passing by. We set up the telescope (including filter!) and looked at the sun. It was amazing how distinct the edge was around Venus. We were also able to see a nice variety of sun-spots. 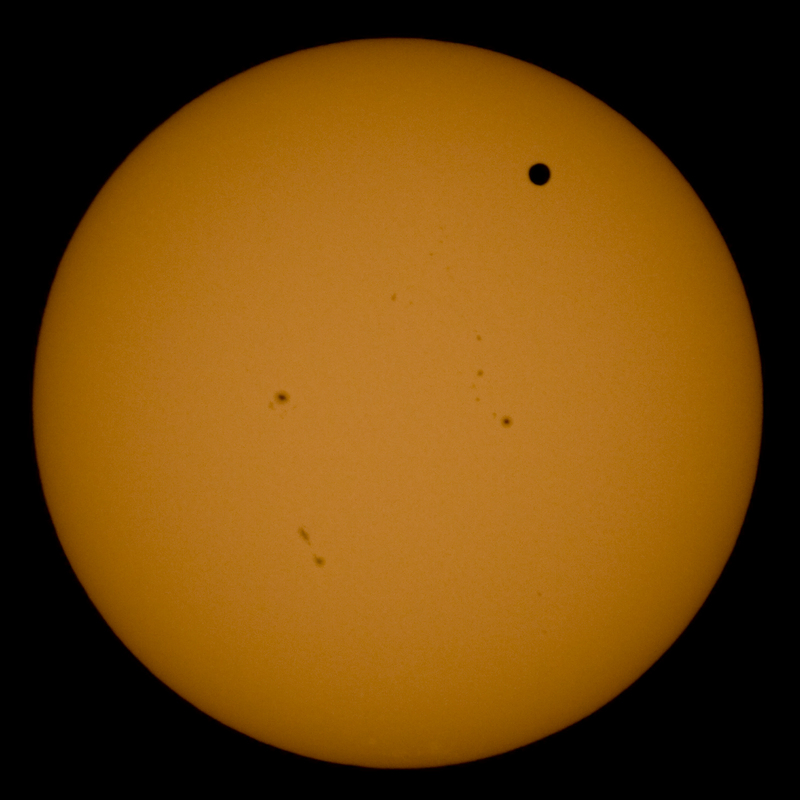 As time progressed, we could see Venus moving along its path in front of the sun. The charging station is at the edge of a gas station and mini mart. This meant a fairly steady stream of people driving by, and many of them were curious about our telescope. 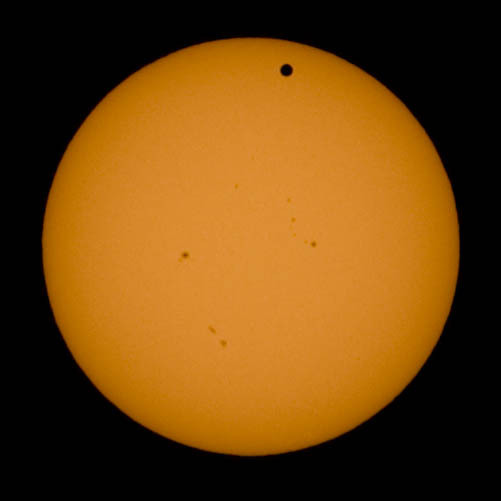 Most people were aware of the transit, having heard about it on the news that morning, so they simply asked "can you see it?" When we told them we could, and asked if they'd like to take a look, we were treated to enthusiastic responses, and got a lot of oohs and aahs as they looked through the telescope. One of the last interactions we had was with a Frito-Lay delivery truck driver. He was so appreciative that he gave us an armload full of bags of chips. That was second only to the gal who was so excited at seeing the transit that she gave us both big hugs. We took the photos below while we were in Tumwater. Minor adjustments were made in Adobe Lightroom to tweak exposure. It bears repeating that viewing and photographing the sun requires an appropriate filter to avoid permanent vision damage. 300mm lens, 1/1000 sec at f/8.0, ISO 200. Notice how Venus has moved in the 20 minutes between the photo above and the one below. Meade 2045 4" telescope (1000mm f/10.0), 1/400 sec, ISO 200. There was a "halo" around a couple of the sun-spots, which is even more apparent in the high-resolution version (1M) of the above photo.